It’s an art and a science. When it comes to harvesting marijuana, you’ll need to put those botany skills to good use in order to harvest beautiful bud. Here are some tips and steps to take when harvesting cannabis. It’s an art and a science. When it comes to harvesting marijuana, you’ll need to put those botany skills to good use in order to harvest beautiful bud. Here are some tips and steps to take when harvesting marijuana. If you’re growing outdoors, you’ll need to consider the strain type and the time of year. But if you’re growing inside, it all comes down to the color of your plant’s trichome resin buds, which contain the THC. Use a small microscope or magnifying glass to find and track them. If the color is clear and translucent, then the bud is immature. 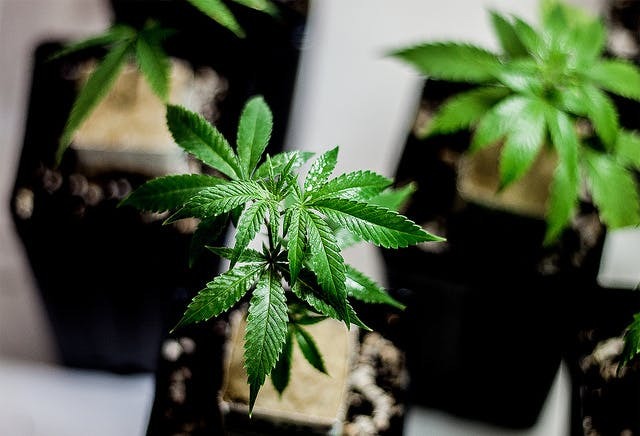 If the color is mostly amber, then the marijuana will have a stronger potency and be “stonier.” The best time to harvest is when the buds are cloudy, milky white and have begun to turn a reddish, brown or amber. This is because the plant no longer needs water as a nutrient. From here, you have a window of five to seven days to harvest. A good rule of thumb is to wait until half of the buds have turned amber before starting the harvest process. It’s also important to harvest in the dark, as direct light will draw up stored nutrients from the plant’s roots. When prepping to trim and harvest, you need to consider the environmental conditions of the room where you’re harvesting. For best results, you’ll need good air circulation (as the air’s smell becomes very pungent) and a drier room. Keep the room at around 70 degrees Fahrenheit and devoid of moisture to ensure your bud is the best quality. Many growers and harvesters like to prep their marijuana by “flushing” out unwanted nutrients from the plants to purify the marijuana. Two weeks before harvest, flood the medium with a heavy dose of water until the nutrient build-ups break down. Wait a few minutes and then add more water—the first dose dissolves the salts, and the second dose flushes them out. Over-irrigating the medium will help the harvesting process. In the days after you have “flushed” out the nutrients, you’ll notice that the leaves will change color, from dark green to light green to yellow. Now, test if your flush is effective by breaking off a leaf and tasting the juices from the stem. If they’re bitter, there’s still plenty of sugar and food in the plant. If they taste clear, like water, it’s go time! A little known fact: different strains of marijuana require different trims. 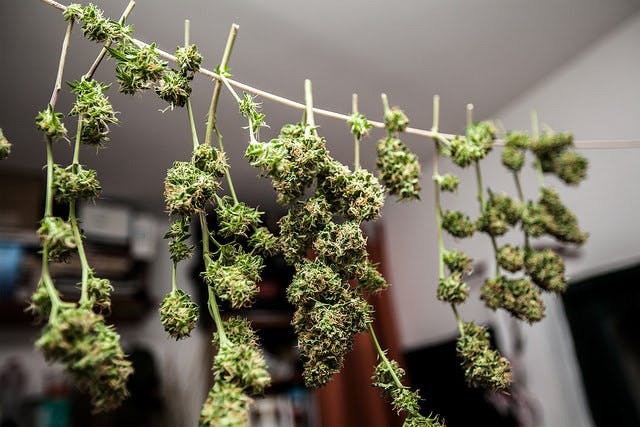 Remove all of the large leaves and trim off the leaf tips that are all around the buds a week before harvest, as soon as the leaves begin to pale in color. Then, trim the leaves not associated with buds first, followed by the ones that are associated with them. Gently turn these over to snip away at the stem and leaf. 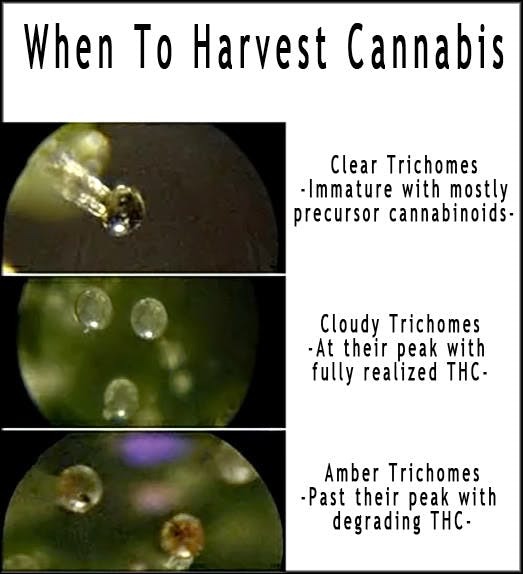 Make sure to be careful during this process as to not damage the bud. The next step is to slowly and consistently dry out the plant. Although you’ve cut the marijuana, the plant is still technically alive as water may remain in its system. 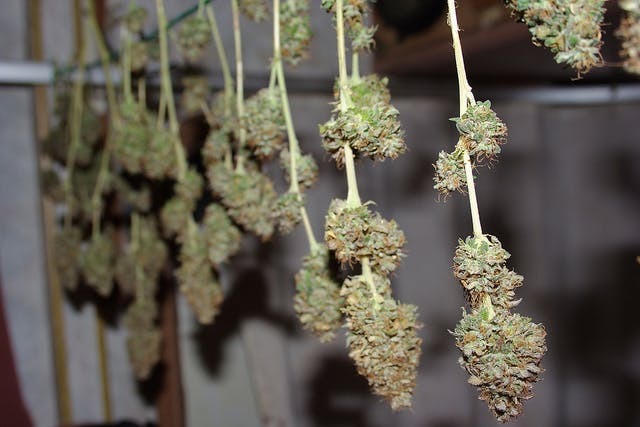 After the plants are trimmed and harvested, hang them upside down on strings to allow for plenty of airflow (without using a machine). They should hang for 5 to 7 days at a room temperature of 70 degrees Fahrenheit with 50% humidity. Four to five days into the drying phase, you may pluck off some of the buds for a sample. Buds are done drying and ready for curing when stems snap when bent rather than just folding. Growing and harvesting is a meticulous and often drawn out process. Stay patient and positive and remember that if you follow these tips, it will be worth it when you are ready to consume your favorite substance.